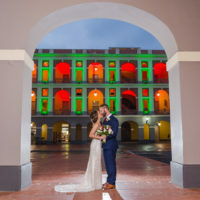 I met Kate and Fritz on one of their wedding planning trips to Puerto Rico. They had just selected the gorgeous Hacienda Siesta Alegre as their venue and I was so excited to work with them! I totally loved their wedding theme. Laid-back, green and grey tones, lots of succulents, and an organic vibe. However, Kate and Fritz immediately showed they were much more than just style, their main concern throughout the wedding day was to enjoy it and have fun along their closest family and friends. Having said so, they did not have a walking processional. They came down the aisle dancing. They did a lot of fun group shots, the bride did a choreographed dance with all the bridesmaids, and well… they put that fun energy into every minute of the day. At the reception time, the dancefloor was full all the time. Just by looking at the images, you can feel the energy this crowd had, and it made capturing it a fun and amazing experience! Hope you enjoy this set as much as I did documenting it! Congratulations on your marriage, and I hope that your life together is exactly like your wedding day: with not one dull moment.